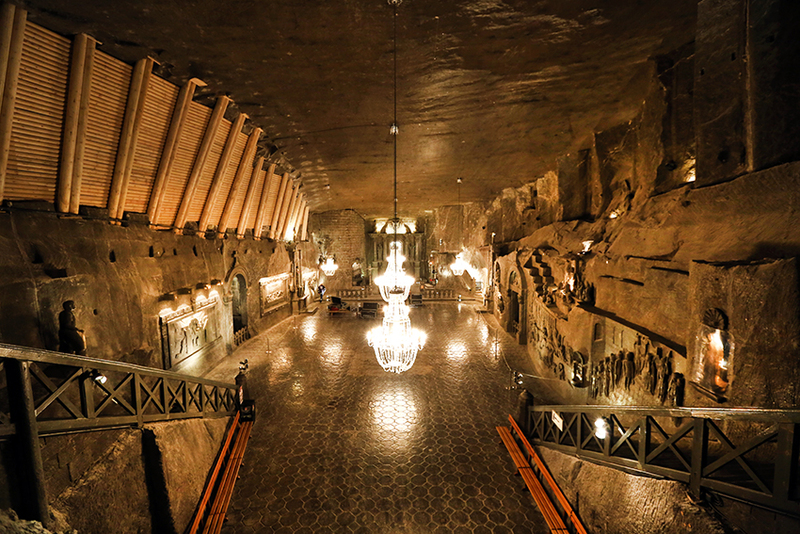 Salt Mine in Wieliczka is a unique Polish landmark. The salt mine, one of the oldest in the world, was established in the 13th century and continued to operate until 2007. This world-class monument has been featured in the UNESCO’s World Cultural and Natural Heritage List in 1978 and is a top tourist attraction, visited annually by more than one million visitors from all over the world. 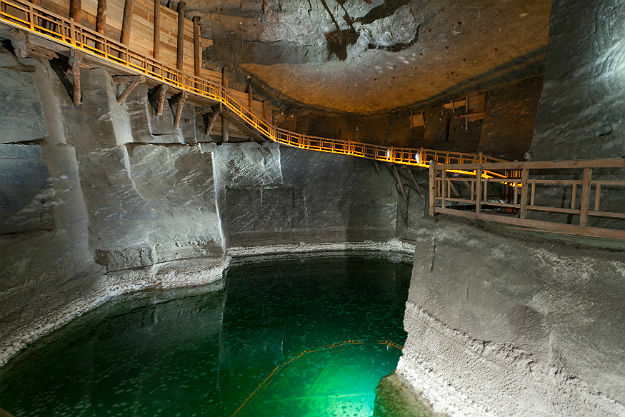 History of salt mining in Wieliczka dates back to the 13th century. Established by the royal decree, Wieliczka Salt Mine was the largest provider of table salt in the region and together with the Bochnia Salt Mine was one of the oldest salt mines in Poland. In Wieliczka also saline baths operated from as early as 1289. Barber-surgeons were employed who offered simple health treatments. The salt mine and baths provided help and assistance to victims of accidents as well as widows and orphans of miners. King Casimir III the Great, one of the most prolific Polish monarchs, contributed largely to the development of Wieliczka Salt Mine, granting it many privileges and laws. He also founded a hospital near the salt mine in 1363. The Salt Mine in Wieliczka now turned into a major tourist attraction, illustrate historic stages of the development of mining techniques in Europe. Traces of the oldest mining sites are well preserved and the overall shape of the Salt Mine present relative authenticity. The underground chambers are decorated in a way to reflect the miners’ tradition and culture. A vast part of those decorations is devotional. The Salt Mine is a testimony of socio-technical system that evolved around salt mining throughout centuries. 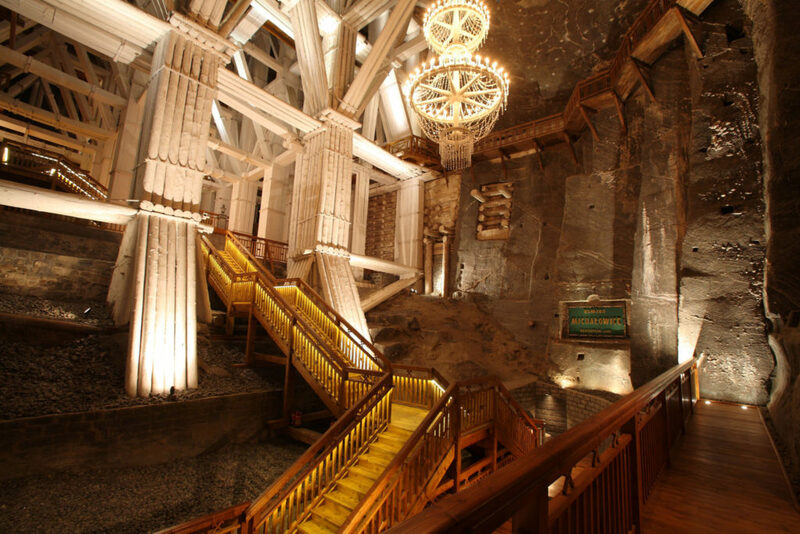 The Salt Mine in Wieliczka is one of a kind not only because of its over seven centuries’ heritage but also because of breathtaking interiors of many underground rooms. It is often referred to as “the Underground Salt Cathedral of Poland”. There are several underground chapels, each excavated with the greatest care. The most exquisite of all is St. Kinga’s Chapel. Wieliczka Salt mine is now an intricate maze, which consists of tunnels with a total length of over 300 kilometres, 3000 chambers and nine floors, the last of which is located at a depth of 327 metres. 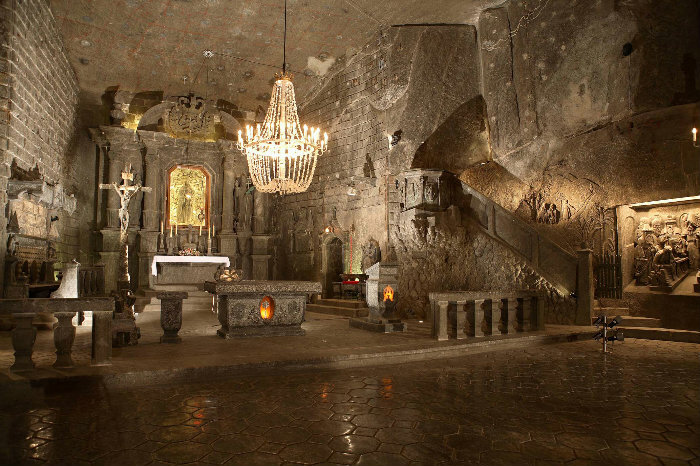 The most impressive of all underground chambers, St. Kinga’s Chapel is located 101 m underground. This 54 m long and almost 12 m high stunning chapel is completely carved in salt. Its beautiful interiors were designed to resemble wooden walls like in medieval churches decorated with bas-reliefs illustrating events from the New Testament. The floor is carved from a single block of salt, and several chandeliers that lit the chapel are made of salt crystals. Thanks to excellent acoustics, the chapel hosted many prestigious concerts. 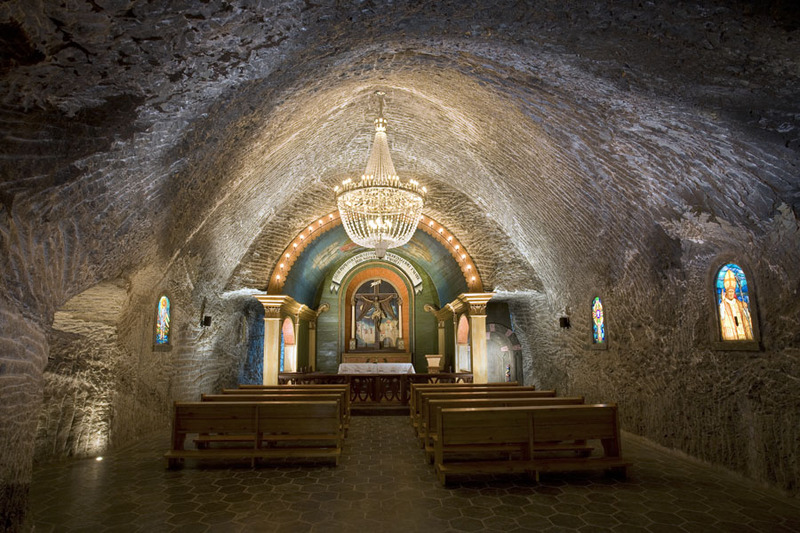 The name of the chapel refers to St. Kinga, associated with the Wieliczka Salt Mine. There is a legend that when Kinga, a Hungarian princess was about to be married to Boleslaw V the Chaste, the Prince of Krakow, she asked her father to be taken to one of the Hungarian salt mines for a lump of salt, prize-worthy in Poland. There, she threw her engagement ring in one of the shafts. Upon arriving in Poland, Kinga asked the miners to dig a deep pit until they come upon a rock. They found a lump of salt that, when split in two, revealed the hidden princess’s ring. Kinga later became a saint patron of Polish salt miners. There are a few options available to choose from, regarding a way of visiting the Salt Mine. A standard Tourist Route is almost 3 km long, 135 m deep and features over 800 stairs, multiple corridors, chapels, statues, and an underground lake. It covers St. Kinga’s Chapel, underground lake and through an underground tavern leads to the Krakow Saltworks Museum. The visit is always conducted in groups, under the supervision of a guide. Miners’ Route is an option for adventurous visitors. It takes place in the oldest part of the Salt Mine, far off the hustle and bustle of the main route. Each visitor receives a helmet and necessary equipment. The expedition is led by a professional guide. Visitors discover secrets of salt mining and have a chance to try themselves in this demanding profession. The Pilgrims’ Route is a testimony to piousness of the miners once working in Wieliczka. It features chapels and religious sculptures by which visitors can pray. Part of the route leads through the Krakow Saltworks Museum. Groups visiting with priests can have the privilege to celebrate a private mass in one of the chapels. The agenda of the Pilgrims’ Route includes a mass at the end of the visit, in the underground chapel dedicated to Pope John Paul II. Wieliczka is located only 10 km from Krakow. The two cities are very well connected. The most convenient way of transportation is booking a private transfer. There are several companies in Krakow offering transfer to Wieliczka from Krakow. There are also available day trips that combine a visit in Wieliczka Salt Mine with Auschwitz Birkenau. A train departs from the Krakow Glowny station every half an hour. The ride takes approximately 20 minutes. The station “Wieliczka Rynek – Kopalnia” is located only a few minutes walk from the entrance to the Salt Mine. Municipal bus number 304, departing in the vicinity of the shopping mall Galeria Krakowska (Kurniki Street), drives directly to the Salt Mine (bus stop “Wieliczka Kopalnia Soli”). Please note that you will need a bus ticket for the Zone I (I Strefa) and II Agglomeration (II Aglomeracja). There are also many private buses that offer transport to the Salt Mine (direction Krakow-Wieliczka). They depart from the bus station near the Krakow Glowny. Every day 7:30 a.m. – 7:30 p.m. 8 a.m. – 5 p.m.
* Please note, that organized groups are required to book a date and a guide in advance. ** Tickets are available to purchase online. Minimum of 10, maximum of 35 persons in a group. Children up to 4 years old – free admission. Additional fee for filming and taking photos: 10 PLN. Entrance fee includes a ticket to the Krakow Saltworks Museum. Minimum of 10, maximum of 20 persons in a group. Accessible only for persons of over 10 years old. Available only for organized groups of 5 or more persons.